I’ve always been a travel junkie. I’ll give credit to my mom who thought nothing of herding my sister and me in the car last minute for a spontaneous long weekend trip to Montreal in midwinter or driving hours out of the way to see “the worlds longest, scenic bridge” on a drive from New York to Florida. Though my dad and sister always complained, I loved it all and still think nothing of getting off an exit when a local attraction peeks my interest. It’s been over 30 years, yet I can still remember the thrill of seeing the Eiffel Tower and Rome’s Coliseum for the first time during a college semester in London — my first time in Europe. Before the Internet, I’d rip out magazine pages of places that I wanted to visit, a habit that still lingers today. And, through touring colleges for Daytripper University, I’ve recently gotten to experience the unique personalities of various cities across the country. To me, the dreaming and planning of a trip are part of the fun, but taking time and doing research takes work — no matter what kind of trip it is. Whether you’re mapping out your college tours or designing a family vacation, here is my roadmap, my sources for how I plan my trips. I hope this helps and inspires you to make your journeys, whether near or far, richer and more memorable. By far the best information is the inside scoop from someone who lives where you’re going or has just been there and — this is key — whose taste you value. I love when someone says, “You must go here and order this,” or “This store has the best eclectic collection.” In addition to great finds, mishaps and bad choices are even more valuable information. It’s good to know when something is overhyped, overpriced and something to avoid at all costs. Guidebooks list the top attractions, but a local will fill you in on quirky little museums or sights like a fantastic sculpture garden or a weekly farmer’s market. With the wealth of information available these days, it’s easy to get frustrated and overwhelmed, not knowing who to trust or listen to. Over the years, I have assembled a roster of a few go-to sources: a trusted network of travel gurus. When I see the same restaurant, store, sight, or hotel popping up on more than one source, I know that’s a good spot to try. For indie finds, witty writing, and good videos, I like to see if the New York Times’ 36 Hours column has covered the area I’m researching. For magazines, I like Conde Nast Traveler, Travel and Leisure, and Afar; Bon Appetit is my favorite food magazine with excellent travel and restaurant information; Food and Wine magazine also has great guides for where to eat, drink, and stay for cities across the United States. And, while the title is misleading, Garden and Gun has entertaining and informative travel articles for the Southern states. Websites I frequent often are Infatuation, Eater for their essential restaurants’ lists (I find their heat map less reliable), Thrillist, and, for NYC spots, Grub Street. Other sites I like include Serious Eats, Time Out, Goop, and Culture Trip. 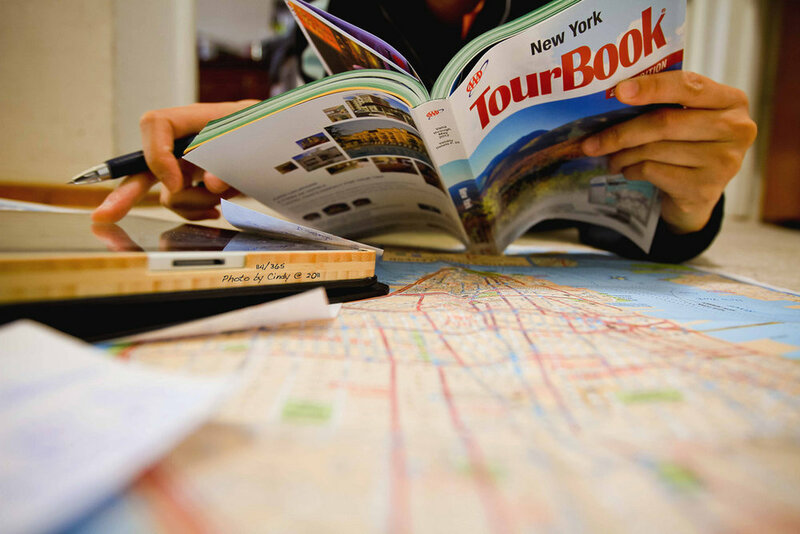 While I don’t use traditional guidebooks anymore, I’ll admit to a slight obsession with the modern day, stylish new generation of travel guides. Favorites include Cereal, Wildsam Field Guides, Citix60, LUXE and Wallpaper City Guides. These guidebooks offer an edited, highly curated approach to each city balancing practical information with insider tips and recommendations, some accompanied by stunning photography, well- designed maps and illustrations. The Dine is a great app from Tasting Table, where you can search for a dining destination by neighborhood, cuisine, or special feature. I don’t personally love Yelp or Trip Advisor, but if it’s a smaller market without much information, I’ll look to see what they recommend. As for college websites, you’d be surprised by how informative most school sites are for visitors. Look and see what dining services are located on campus or what area restaurants they recommend. Some schools also have admissions or student blogs where you can often find more personalized restaurant recommendations and interesting things to do in the area. There’s also Spoon University, a site run by students, which is a good place to find which iconic places students frequent (especially those that are casual and inexpensive). Also, I’d be lying if I didn’t include Google. The search engine is my best friend: are you touring colleges and wondering where to stay and eat in, say, Nashville? I’ll first Google ‘the best places to stay and eat in Nashville’, and then narrow down my search to spots near Vanderbilt University. I always play around even further trying things like ‘where do top chefs eat in Nashville’ or ‘whats news in Nashville’. This often leads me to my favorite sources mentioned above, but sometimes — especially when I scroll down past the top rankings — it’s a way to find information you might not otherwise see, such as articles from local newspapers or blogs. Scroll through Facebook and Instagram accounts of places you’re considering for visuals that capture the look and feel of the place. I don’t often do this, but hotel and restaurant Instagram accounts — especially their stories — offer a photo tour beyond the written word. My daughter and I have used this tool to see what dishes look the best before we go to a restaurant (yes, we’re obsessed). Talk to locals, grill the hotel concierge or front desk staff, and ask your student guide on the college tour where they take their parents when they visit. Sometimes the best tips come from people in the restaurant business, especially waitresses and bartenders. You can always get a sense when someone is a foodie and is eager to share their favorite haunts. The same goes for local shop owners; after all, they get to know their little neck of the woods well. Road Tripping: Heading out by car, there are excellent free road trip tools to use on your smartphone. The website and app Roadtrippers, our favorite, is an invaluable resource not only on how to get from Point A to Point B, but on points of interest along your route, highlighting off the beaten path sights you’d otherwise miss. Use their curated, pre-planned suggested itineraries with “the best places to eat, sleep and see on every highway” or create your own. I guarantee your trip will be more interesting-dare I say even fun-if you break up the monotonous hours on the road. Design your trip on your computer: once your route is saved, it syncs with your phone, and you can even share it with friends and family. RoadAhead is another good app that provides information about what's available off nearby highway exits, from fast food to gas stations to rest stops and hotels. I’ve always liked to approach my college road trips as a traveler-not just a mom on a mission-but for the times when I want to take the most direct route I relay on navigational tools like Waze and Google Maps. (I like the explore nearby feature on Google Maps) Recently someone told me about another app, Furkot, that I might try out on my next trip. Stayed tuned and Happy Touring!